Nowadays, we are using a lot of 3C products in our daily life. It is no matter children, young people, mid-lifers or the silver generations also chasing for more advance and high technology which can improve, enhance and simplify their lives. However, did anyone of us alert on the side effect which given by all these devices? Have you ever worried your hearing might be getting bad? Here some apps available to help those who suspect they may be experiencing hearing loss by testing their hearing on their mobile app. You can now check your hearing at home by using your Android device and with a good headset. This application begins with a test of 15 questions, focusing on situations where you might encounter hearing problems. Instead of pressing, the user can slide the volume up and down for each frequency to the one is comfortable then only proceed to the next tone or question. 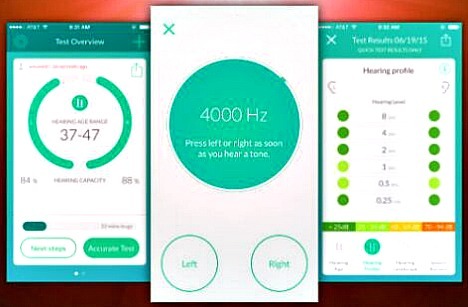 Once done all 15 questions, this app will tells you whether it have determined you may have a hearing problem and offers ways to contact the specialists via the Internet. These apps are just a quick way to give you a preliminary test by using mobile phone. Please bear in mind that all these apps are not designed to replace the professional advice from and audiologist, hearing aid specialist or ear doctor. It would be better if getting professional advice from specialist.